Can’t get into Chiltern Firehouse? Try here instead. Australia has a lot to answer for. Tony Abbott, Home and Away and The Veronicas are all things I can easily live without. But the Antipodes has also given us Kylie Minogue, the flat white and the Tim Tam Explosion. Modern Australian cuisine is also something to be treasured – its unique melding of Asian, Mediterranean and Middle Eastern influences is, at its best, a wondrous thing to behold. In a dirtier, more savage time, i.e. the 1980s, this would have been called ‘fusion’ cuisine, but I prefer to call it eclectic. The Providores and Tapa Room is one of the best places in London to sample this modern, eclectic Australian style of cooking. This restaurant is split over two floors with the Tapa Room on the ground floor operating a first come, first served, no reservations policy. The Tapa Room’s buzzy vibe, semi-communal tables, plastic garden furniture and somewhat cramped surroundings makes it feel very different from The Providores upstairs which does take reservations and has cloth-covered tables with proper chairs, but still with a relaxed, casual atmosphere. The two share a very similar menu that changes once every month or so, but The Providores has a few dishes that the Tapa Room does not. Additionally, while the Tapa Room is a la carte, the Providores has set menus from two to five courses that work out cheaper per dish than the Tapa Room for the same number of courses. Few things are more pleasant than a dinner on a warm summer’s evening with The Flame Haired Squelchie. As a lapsed vegetarian, the Squelchie appreciated the varied nature of the Tapa Room’s numerous vegetable dishes. 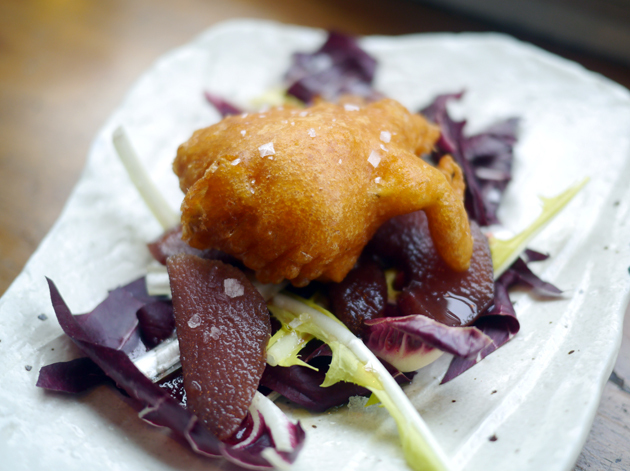 A buttery artichoke arrived coated in a smoky, crisp batter which had a soft underlayer. 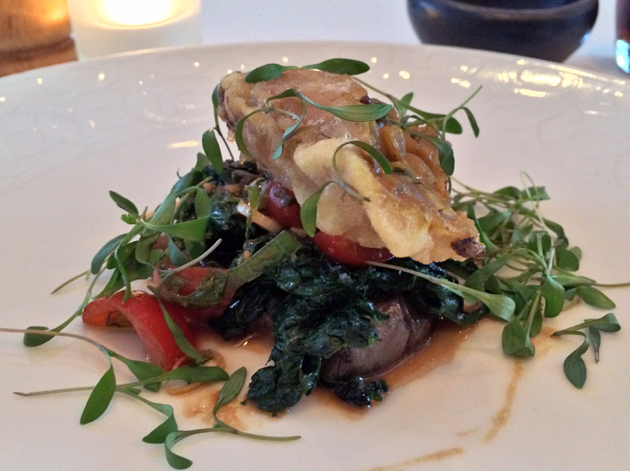 The battered artichoke was complimented exceedingly well by the tartness of the poached pear slices and the nutty leaves. The tortilla wasn’t quite as cracking as the artichoke, but it was still very good. 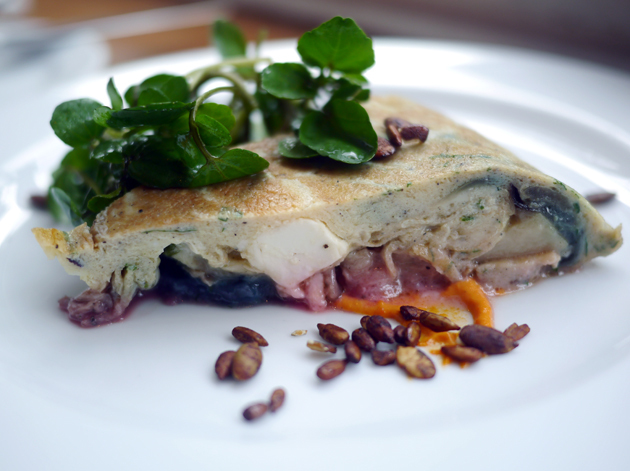 The potato and beet-flecked tortilla managed to be creamy, yet silky and light at the same time. Most of the flavour in this dish came not from the tortilla though, but the accompaniments of sharp leaves, nutty seeds and a lightly smoky and garlicky aioli. I’ve tasted very few salads that are better than the one here. Oaty freekeh, a lightly earthy goat’s cheese, bitter leaves and crunchy green beans were served in a richly umami tomato and miso dressing that left me panting for more. Although we didn’t deliberately set out to have a vegetable-dominated meal, we ended up having only one meat dish the entire evening. Although the twice-cooked sweet and sour pork belly wasn’t quite as accomplished as the vegetarian dishes, it wasn’t too far off. The chunks of swine flesh were tender with a layer of rendered fat that was rich, but not enough to overpower the smoky, woody taste of the bark-like crust. Although the rich umaminess of the marinade drowned out the meat’s porkiness and the fresh butternut squash and spinach served alongside it, it was so good that I honestly didn’t care. 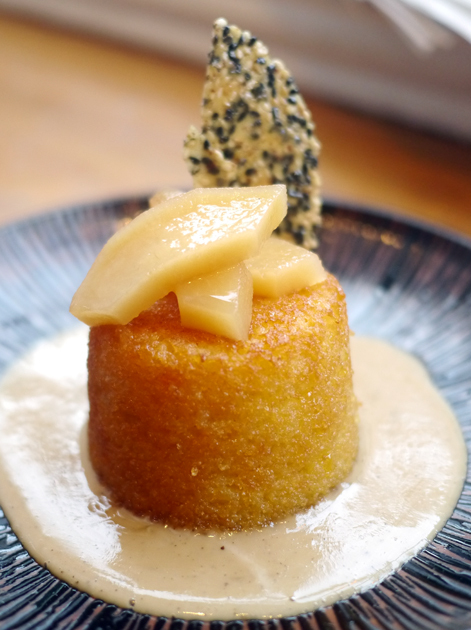 Although my dessert was advertised as a potato cake, there wasn’t anything starchy or earthy about it – it was very light and fluffy with a zesty orange taste to it. The cake was complimented brilliantly by tart quince, a nutty brittle and a thin, yet flavoursome cardamom custard. Sumptuous. 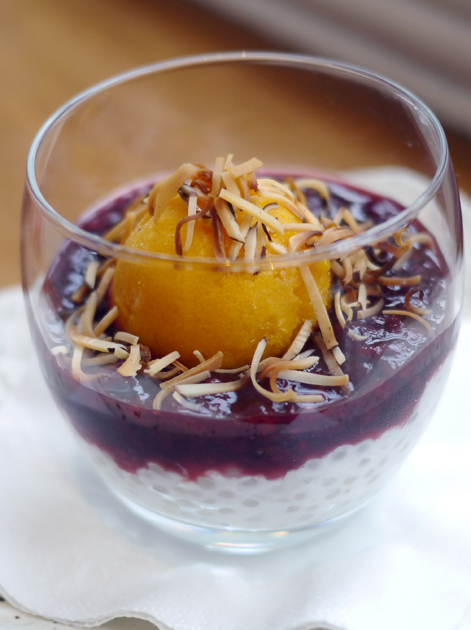 The Tapa Room’s fresh, creamy, gelatinous coconut tapioca puts the tapiocas available in Chinatown to shame. It’s therefore a shame that the mango sorbet tasted more like passion fruit and that the layer of compote was very generic. 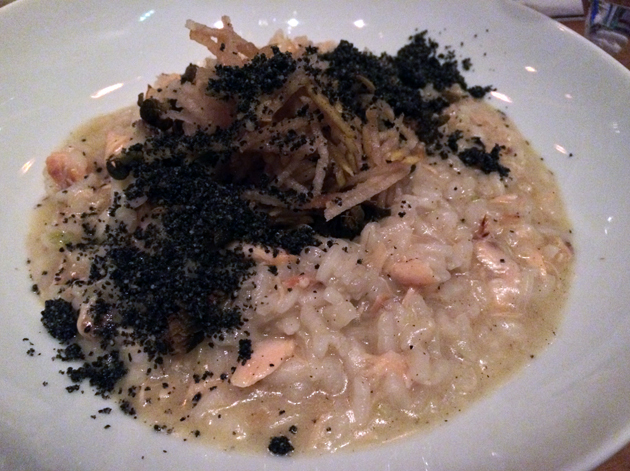 I returned to the Tapa Room without the Squelchie and started off with a hot-smoked salmon and confit garlic risotto. The rice was quite loose and not especially creamy, so it almost resembled orzo or a congee rather than a risotto. This hardly mattered though when the rice was dotted with boldly smoky, intensely fishy flakes of salmon and punchy garlic. Although there wasn’t much of the promised capers and shallots, the crisp julienned pears and nutty sesame proved to be surprisingly complimentary to the salmon and garlic. Overall, top-notch comfort food. The smooth, glossy and tender slices of lamb loin may have been small, but they were cooked rare and had a delicious smokiness to them as well as a crisp crackling. A slightly sour and refreshing yoghurt counterbalanced the relative richness of the meat, while the crunch of pomegranate added some contrast in texture. 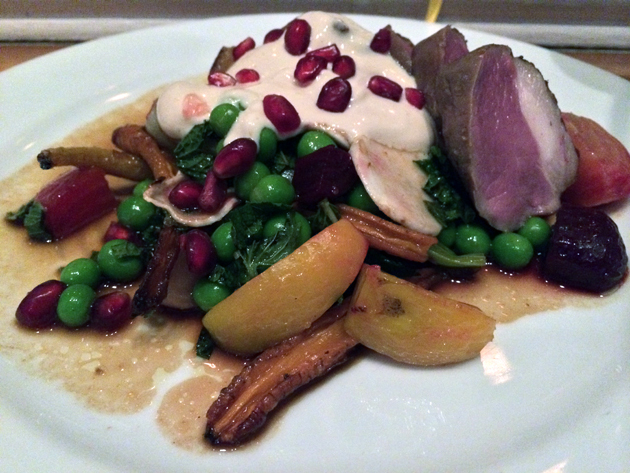 The accompanying greens were no oversight – fresh baby vegetables with punchy hints of mint. 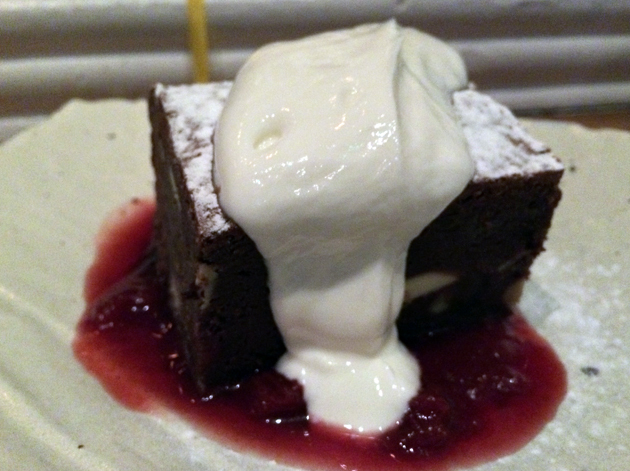 The sole disappointment of my second visit was the brownie for dessert. It was a touch too dry, while the cherry and apricot compote was mouth-pursingly sweet. The herby, grassy yoghurt and crunchy, flavoursome hazelnuts compensated for these disappointments to an extent, but not enough to stop me buying a far superior Paul A Young brownie on my way home. I was greatly impressed with the Tapa Room, but thoroughness demanded that I try out The Providores upstairs at least once to see how they compared. I generally stuck to dishes not available downstairs, starting off with their version of laksa, a classic Singaporean/Malaysian noodle soup. 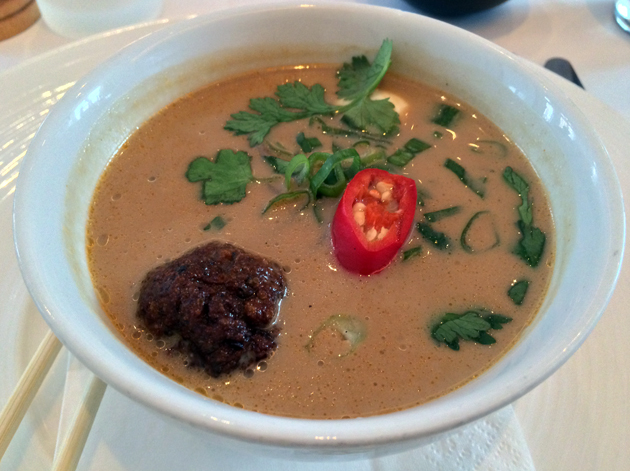 Although the soup wasn’t as spicy or as fishy as the laksas I’m used to, the coconutty, vaguely curry-like soup was still satisfying. Soba noodles were used instead of vermicelli, but the dish was none the worse for it. I could’ve done without the lone quail’s egg though with another one of the herby, peppery fish balls in its place. Just one of these addictive fish balls isn’t enough. Noodles lurking under the surface. The stuffing of the fried inari pocket, a mildly curried collection of lentils, was pleasing which is more than can be said for the inari itself. The tofu skins were heavily over-fried, leading to a thick, stodgy, somewhat bland result that lacked the supple tartness of more traditional inari. As pleasing as the lentils were, they didn’t really compliment the accompanying bed of spinach, aubergine and richly umami tomatoes. A disappointing, unbalanced dish. 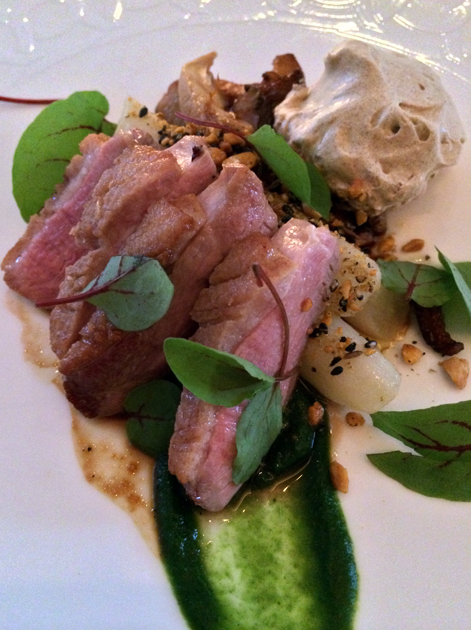 Smoked Dutch eel conjures images of ganja-infused seafood, but such police-bait sadly wasn’t a reality. Still, the smooth, delicate slices of eel had a distinctive smokiness to them and complimented well by the slight oily squidginess of salmon roe. Although the nutty, peppery bed of spices wasn’t quite punchy enough, it still had enough heat to add another layer of flavour to the eel. The samphire wasn’t quite as crunchy or salty as I expected, but perhaps that was for the best given the already busy nature of this flavoursome dish. The small slices of duck cooked rare were tender and fatty, but they didn’t quite mesh with either the earthy mushrooms or the nutty spices and cream. 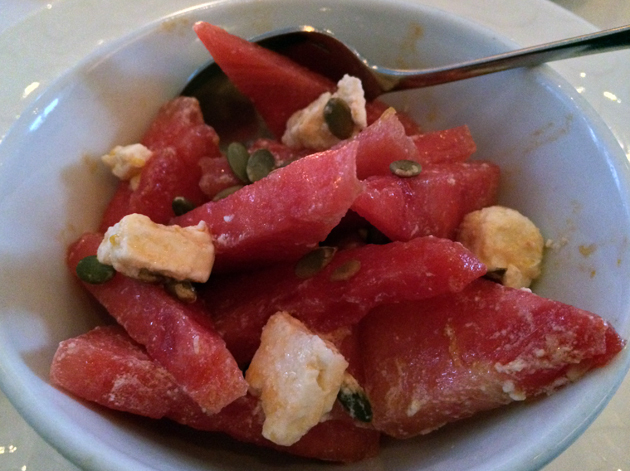 Watermelon and feta salad is becoming a summer cliche. The version here started off well with crisp, refreshing fruit topped with nutty pumpkin seeds, but the crumbly feta wasn’t creamy enough to avoid being overwhelmed by everything else. 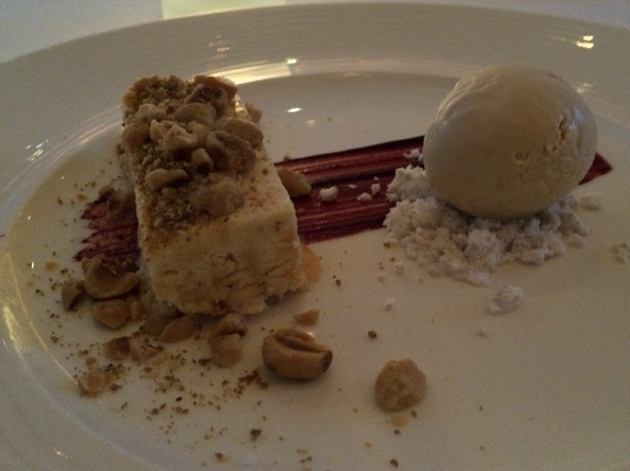 The frozen hazelnut nougat was smooth and icy, although its nuttiness was a little subdued. The accompanying coffee ice cream was appropriately icy and bitter, but it didn’t really compliment the nougat, while the cherry sauce and hazelnut ‘snow’ added little. 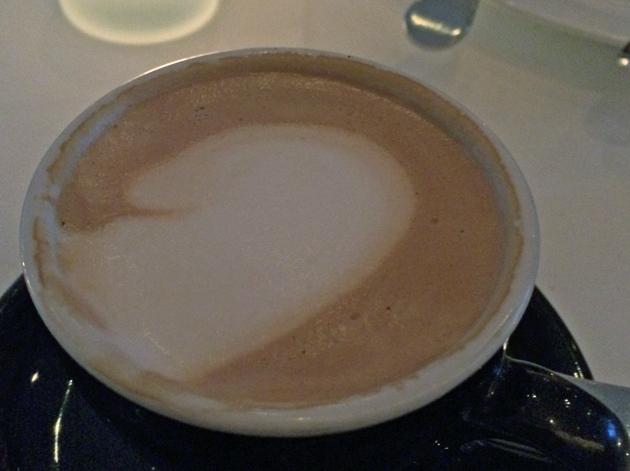 Surprisingly for an Antipodean place, the flat white was disappointingly watery and bland with a head that was too foamy. What the Tapa Room lacks in style and comfort, it more than makes up for in the quality of its cooking. 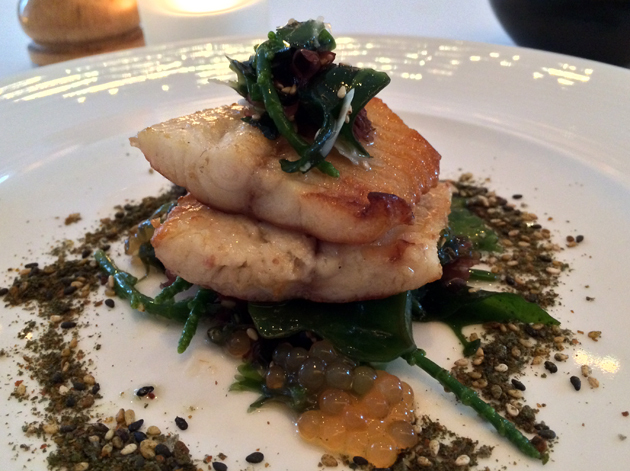 Although it’s not perfect, it easily serves up some of the best food I’ve had in a long time. Disappointingly, The Providores isn’t that much of an upgrade over its downstairs counterpart – its exclusive dishes aren’t as well-conceived and well-executed as they should be, nor are the surroundings or service polished enough. Its only real advantages are that you can book a table and, if you’re eating a large number of dishes, it’s better value. 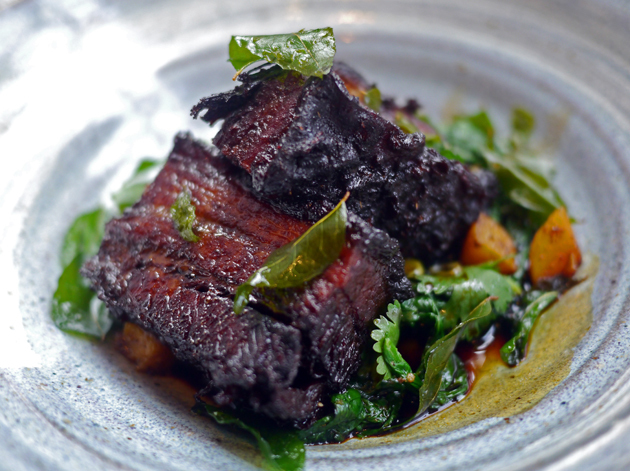 Still, the Tapa Room is a great restaurant and if you can’t get into the nearby Chiltern Firehouse, this rough and ready gem is a fine, fine alternative. Average cost for one person including soft drinks and coffee: £50 approx. at The Tapa Room. £80 approx. for five courses at The Providores. 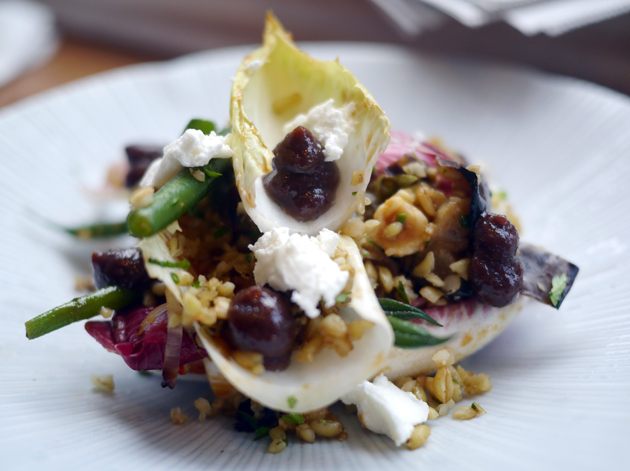 Tags: artichoke, brownie, cake, duck, eel, feta, flat white, ice cream, laksa, lamb, london, pork belly, restaurant, review, risotto, salad, tapioca, the providores and tapa room, tofu, tortilla. Bookmark the permalink. I’ve always preferred the vibe downstairs. Providores serves a good Sunday brunch, though.